Our factories are will-equipped with a wide range of state-of-the-art machinery for the efficient and express production of HVAC ducts/components. AirTech has the latest CNC machines for fabrication and processing. The VICON Model 8000 dual table HVAC plasma cutting system employs cutting-edge technology to fabricate duct fittings and other sheet metal components with precise and rapid precision. 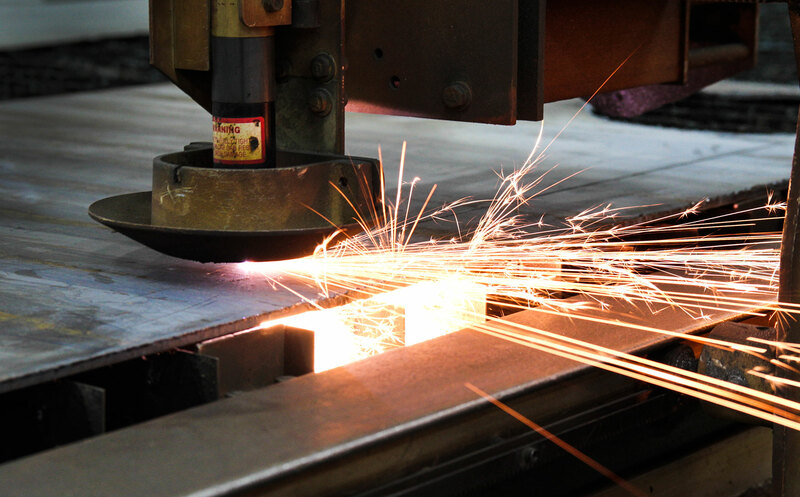 It solved the chronic problem in Bahrain of imprecise hand-fabricated sheet metal production. The entire process is controlled with the specially designed VICON 3.2 software that ensures a relatively smooth, fast, and accurate manufacturing process. The software allows us to fabricate duct works in line with DW144/SMACNA/ASHARE standards, and hence permits AirTech to meet all the different ducting requirements of our clients. The introduction of CNC Plasma Cutting systems in our duct processing line has helped us to improve the quality of the duct fittings, as well as our daily production capacity. This machinery allows AirTech to take on time-sensitive projects of great breadth, and complexity. To process the Galvanized Coils for producing GSS square ducts, we have automated the production line with a CNC-controlled coil line System. This enables the company to process square ducts at any width and up to 1.5m in length with precise measurements. Given that 70% of the ducting in any project will be straight-run ducts, the automated duct production has a significant roll in helping the company to complete the duct works with a fast phase. With CNC controlling the coil handling, the process is now extremely efficient, producing top quality products with short production times. The ability to quickly process the coils means that we do not need to as much storage space for the coils, and have more space to store raw materials and finished goods. The German RAS Duct Zipper is a revolution in the duct manufacturing industry. This machine enables us to join ducts with 100% leak-proof seam-locking system with minimum processing time. The coil line produces open ducts that are passed through the RAS duct Zipper to form the square ducts. This vital piece of technology helps produce a large quantity of ducts with relatively short processing time and labor. Straight-run processing was a much more difficult task before the RAS Duct Zipper System, when we were using the conventional Pittsburgh system. This novel German folder exhibits a unique performance level and enables speedy processing of duct fittings such as reducers, offsets, and other square fittings. Any degree option in the system setting enables the fabricator to manufacture even the more complicated fittings to suit the site requirements. The UK made Morgan Rushworth hydraulic Folder is capable of folding precision bending works for forming duct fittings. The machine can handle various gauges of sheet metal with minimum forming time. This helps achieve higher productivity in fittings and fabrication. The Engel Model beading machine confirms with DW144/SMACNA/ASHARE, which states that the sheet metal requires stiffening by way of cross basing/beading. All the fittings are beaded to match the straight ducts so that sheet metal duct works are more strengthened. This RAS German machine is used for closing the seams of GSS round ducts, round to square fittings and plain sheets. This highly advanced machine enables us to process the fittings much faster than with the traditional method. The round ducts/joints formed out of this machine is 100% air leak proof. Thus, most welcomed in the HVAC industry. Additionally, the following machines are doing the associated jobs for final out put as completed duct works. Spot welding machine for making circular fittings. Pin Spot Welding machines for fixing insulation fasteners on acoustic/thermal insulation. Two ARC welding machines MS black sheet duct welding.